The gunman explained he targeted New Zealand because Muslims feel safe here and explicitly mentioned President Donald Trump. Of course, countless more views occurred in the hours afterward, as copies of the video proliferated online. Facebook caves on discriminatory ads, then tries to sell it as a ‘triumph’ — After an 18-month court battle and years of fierce criticism, Facebook says it will stop allowing housing, jobs, and credit advertisers to show ads to only users of specific races, genders, or age groups. But wait, there’s more — It’s scary how much personal data people leave on old devices. A recent experiment by Josh Frantz, a senior security consultant at Rapid7, suggests users are taking few if any steps to protect their private information before releasing their used devices back out into the wild. Venezuelan soldiers escape over the border — Over the past month, nearly 1000 Venezuelan troops have fled to Colombia to avoid arrest back home, according to the Colombian Foreign Ministry, which recognises Guaidó as Venezuela’s interim president. Natural disasters — Flash! Bang! Meteor! A meteor explosion over the Bering Sea late last year unleashed 10 times as much energy as the Hiroshima atomic bomb, scientists have revealed. And again — The second-largest asteroid to hit Earth in the last 30 years went undetected, until now. Measuring several metres in size, the space rock exploded 25.6km above the Earth’s surface with an impact energy of 173 kilotons (about 40% of the above meteor). Sharp and potentially devastating temperature rises of 3C to 5C in the Arctic are now inevitable even if the world succeeds in cutting greenhouse gas emissions in line with the Paris agreement. Africa’s Cyclone Idai — Rescue workers are continuing the search for survivors of Cyclone Idai, which swept through Mozambique, Malawi and Zimbabwe last week, destroying towns and villages in its path. 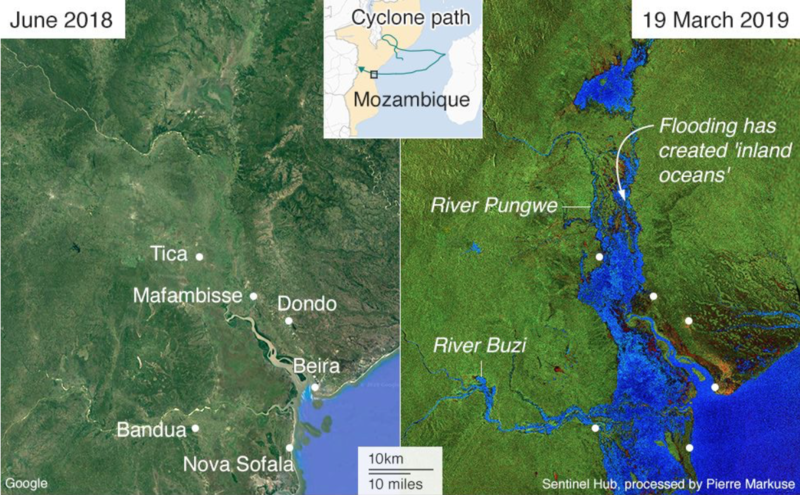 Floods of up to six metres (19ft) deep caused incredible devastation over a huge area of Mozambique. And the good news? New Zealand’s Prime Minister Jacinda Ardern has shown other world leaders how to lead, with love and understanding and firm resolution. Thank goodness I am a citizen of her country!